are working just fine at Bartlit Beck. FRED BARTLIT JR., IS HUNKERED OVER his laptop. At age 63, in casual attire, the trial lawyer looks a lot more like Charles Atlas than, say Edward Bennett Williams. Bartlit's pectoral muscles are straining against the brightly colored silk of his short-sleeved polo shirt. Silver chest hairs protrude from the well-tanned cleavage visible through the open shirt. He stares at the screen and jabs the keys with military precision. He leaps up to dim the lights in the "forum," the great open area at the heart of the Chicago offices of Bartlit Beck Herman Palenchar & Scott LLP, Bartlit's two-year-old firm. A giant screen hangs from the ceiling magnifying the laptop display of the outline that Bartlit has been preparing for a key deposition. He stomps back resolutely as a young partner and an associate look on. Walking never seemed so purposeful. Yes, Fred Bartlit is easy to caricature. The grim intensity he displays when making even the most innocuous statement. The machine-like cadence of his voice. The relentless prosthelytizing for his vision of the legal world of the future. Yet something is happening here that would be unthinkable in most firms: Bartlit is drafting the outline while the two young lawyers stand by. And if the ability to type or use a computer is no longer unusual for a senior partner, the division of labor certainly is. Moreover, as obvious as it is that Bartlit is running the show, it's equally clear that the relationship here with the junior lawyers is not one of master and slave. He types. He gets the lights. He adjusts the screen. They comment on his outline. Seconds later Bartlit demonstrates the firm's technology, showing off a complex database through which he can instantly retrieve thousands of pieces of information on the case, a negligence suit in which he is defending Alpha Therapeutic Corporation, a company facing huge liabilities based on claims that one of its blood products transmitted the AIDS virus to hemophiliacs. The moment exemplifies the Bartlit approach to practicing law. The hands-on philosophy, the taut staffing, and the high technology are all essential elements of what Bartlit treats as almost a religious creed, one that he propounds loudly in seminars, client meetings, and just about everywhere else. The case itself is emblematic, too: It's the kind of high-stakes, high-profile trial that Bartlit has always craved. And, like half of the 20-lawyer firm's work, it's being done for a non-hourly fee, in this case a flat fee plus a potential bonus for a win. That, too, is a key tenet at Bartlit Beck: The firm uses alternative fees whenever possible, including in the transactions handled by its five-lawyer corporate department. Bartlit and his partners are on a mission, one that led Bartlit to turn his back on 33 years at Chicago's Kirkland & Ellis to launch his own firm, taking 18 of his colleagues with him. (The remaining Bartlit Beck lawyers include another former Kirkland lawyer hired later, three other laterals and six hired out of law school or clerkships.) Like most religions and most cults, for that matter, this one has its dogma. Just ask any of the lawyers. Hourly billing rewards inefficiency rather than results. The more inefficient a large law firm is, the more money it makes. Thus the law firm's and the client's needs are in opposition. Bartlit and his acolytes are promising a revolution. Firms like Bartlit Beck, they claim, will replace the big firms eventually. Nonhourly fees and bonuses for success give the lawyers incentives to be efficient. That way clients pay a lot only if they're happy with the results. Technology means the lawyers can be efficient and try cases with only two or three lawyers. And with clients paying for results rather than hours, the firm's structure will resemble a "diamond": a few senior partners at the top assisted by a larger band of experienced trial lawyers, and supported in turn by a small team of junior associates being trained. The revolution may not have arrived yet, but Bartlit Beck has started strong. To a large extent the firm is doing what it said it would: trying big cases with small teams and making money at it. In two years the firm's five equity litigation partners have won three significant jury verdicts. Those victories fueled handsome per-partner-profits in Bartlit Beck's first full year: just under $800,000 -- virtually the same as what those lawyers were earning at Kirkland. Bartlit Beck's lawyers like to credit the firm's philosophy with luring clients. But interviews with 11 clients suggest that many still choose the firm for the most old-fashioned -- and laudable -- reason: They know and respect its lawyers. Bartlit's gleaming reputation in particular attracts clients in droves. And it allows the firm to pass up assignments that would drag it into the muck and body-intensive toil of discovery. Also, the firm can pick not only the best cases, but also the best parts of the best cases. For example, Alpha Therapeutic has handed most of the laborious document work off to another firm, Glendale, California's Knapp, Petersen & Clarke, while bringing in Bartlit Beck primarily to serve as trial counsel. So thus far, it's more the cult of Fred Bartlit -- and to a lesser extent his partners -- that accounts for the firm's success, and less an affinity for its message. But if the messengers' success continues, a lot more people will start listening to the message itself. Bartlit Beck touts itself as different from the big firms in which its lawyers once practiced. Sensitive to visual symbalism, and anxious to be regarded as elite trial lawyers, the firm has set up shop in a decommissioned nineteenth-century Chicago courthouse, where Clarence Darrow once defended Leopold and Loeb. The 19-foot ceilings and massive windows give the space a light, airy feel. The space includes an irreverent, if well-planned, touch: a regulation height basketball hoop and back board. The industrial carpeting is painted with a threepoint line (although managing partner Herman concedes they haven't adjusted its placement since the NBA changed its own last year). Three basketballs lie haphazardly on the floor. Around the corner, taking up the better part of one side of the building, is the firm's mock courtroom, complete with judge's bench, witness stand, and jury box. Like the forum, it is accorded prime space. And like the forum, it is not walled off. Here the firm's lawyers square off against each other, holding one day mini trials to prepare for the real thing. Though Bartlit is hard to miss, charging around the office, the picture of intensity, this is not a firm whose lawyers are made in his image. In particular, managing partner Sidney (Skip) Herman, a fellow Kirkland refugee, is strikingly different from Bartlit. A 42-year-old litigator who specializes in antitrust and trade secret cases, he seems as much a facilitator as a leader in his role as managing partner. He's solicitous where Bartlit is commanding. Relaxed and affable, his body language says, for you, I've got all the time in the world. The physical differences between the two men are apparent as well. No gym-size pectorals here: Tall and just a few pounds over lanky, Herman wears an Armani shirt that billows over the void between his shoulders. Both he and Bartlit, however, slip easily into a sports metaphor to explain how the firm capitalizes on its lawyers' individual strengths. "Forwards play forward. Guards play guard," Herman explains. "At Kirkland I was great with clients and didn't care as much about trials. Beck was great with trials but didn't care as much about clients." "We don't have committees" name partner James Palenchar proclaims proudly. "We make decisions." Several times that decision making has meant that the entire firm -- including support staff -- sitting down to discuss an issue. In October the Chicago and Denver offices gathered via conference call to chew over the question of the firm's growth. Using a pure concensus process -- with no vote by the partners or anyone else -- the group decided to hire no more than two or three associates per year. "It was a free-for-all," recalls Palenchar, 45, also a former Kirkland partner. "It was quite unlike anything I ever experienced at my old firm." When Bartlit, Beck, and 16 of their partners and associates left the Chicago and Denver offices of Kirkland & Ellis in October 1993, it represented the end of a high-profile experiment at Kirkland. After a prolonged conflict -- capped by a threat to leave the firm -- in 1992 Bartlit's massive rainmaking had won him and his ideological cohorts the right to try nonhourly fees ["His Way," May 1992]. "It took so long to happen that it was moot," agrees Herman. "It just didn't work." In addition, he recalls, the firm stymied his group's efforts to build a "forum" similar to the one that now exists at Bartlit Beck. Beyond that, Bartlit asserts, Kirkland's structure doomed the project. "It is impossible to innovate in a major way in a mature institution," he argues. "My innovations are broad and deep." Since, Bartlit argues, firms such as Kirkland make their profits by leveraging the hours of associates, his ideas could never really take hold there. His system saves clients money, he claims, and makes lawyers money only when there aren't a lot of associates running around, leveraging profits and creating overhead. In Bartlit's nomenclature, Kirkland couldn't be a diamond and a pyramid at the same time. As Bartlit began to consider launching his own firm, he discussed his alternative fee and staffing ideas with NL's Martin. Martin, who describes Bartlit as "one of my best friends," says he strongly supported alternative billing. Thus Bartlit knew that any new firm could count on work from NL, which was bringing Kirkland some $510 million in annual billings at that time. Solid links to other longtime clients, such as Shell Oil Company, whose general counsel Allen Lackey is strongly committed to alternative fees, helped the venture to hit the ground running. Two years later, asserts managing partner Herman, "we have more business than we can handle." Briskly demonstrating the capabilities of his laptop, he clicks on an e-mail that lists recent matters that the firm has turned down or chosen not to pursue. The client names include General Motors Corporation, E. I. du Pont de Nemours and Company, NL Industries, and Reebok International Ltd.
those who came when threatened with the imminent prospect of a trial in a high-liability suit; alternative fee zealots seeking small, notable firms like Bartlit Beck; and those whose relationships with the lawyers date back to Kirkland days. Most clients pick the firm for its lawyers, not its abstract ideas. "It was solely Bartlit that drew us to the firm," says Alpha Therapeutic general counsel Edward Colton, who is using Bartlit for the first time in his company's major negligence suit. "The jury's still out" on flat fees, Colton adds with minimal enthusiasm, although he's quick to point out that he's been happy so far and is giving more work to the firm. George Lykos, assistant general counsel of Bayer Corporation, also turned to the firm because he needed high-quality trial lawyers, in this case because his company faced $100 million in potential liability in a patent dispute. (Lykos says he had used Bartlit Beck's Herman at Kirkland.) "[Alternative billing] was not a significant factor; indeed, it was not a factor at all in my decision to retain Fred," Lykos notes. Still, he expresses satisfaction with both the result of the case and the billing, a flat fee and bonus arrangement whose terms he declines to reveal. On the other hand, some clients, such as DuPont, are attracted to the fee structure. "We were looking for law firms that were really flexible using alternative billing," says Daniel Mahoney, manager of law firm partnering for DuPont. Mahoney had met Bartlit when Bartlit was at Kirkland, but didn't retain him until Bartlit formed his new firm. When DuPont slimmed down from 315 outside firms to 34 -- most of them smaller firms -- Bartlit Beck was selected to handle DuPont's litigation in the Rocky Mountain region. The older relationships include litigation client United Technologies Corporation, the largest in terms of hours, and the second-largest, NL which sends the firm both litigation and corporate assignments. (The firm tracks hours even for clients who aren't billed by the hour.) These two companies, together with investor Bill Koch, DuPont, and Alpha Therapeutic, account for about one-third of the firm's total billings, according to Herman, who, along with his partners, declined to provide more specific financial information. Other litigation clients include Cordis Corporation, General Motors, Asea Brown Boveri, Inc., Dresser Industries, Inc., and Coopers & Lybrand. About 50 percent of current revenue comes from nonhourly fees, says Herman, who also notes that the firm now takes only new clients who are willing to accept nonhourly bills. But that edict does not apply to those existing clients, such as United Technologies, which have not embraced alternative fees. And the United Technologies relationship sheds some light on why the firm may prefers nonhourly billing. 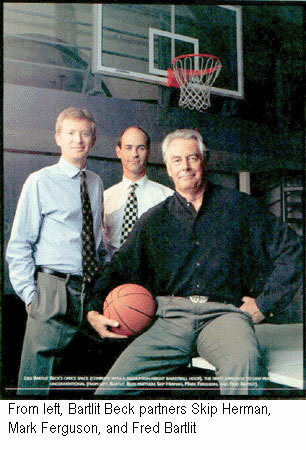 UTC's work accounts for 21 percent of the hours logged by Bartlit Beck in 1995, according to information confirmed by Herman. But that 21 percent of hours translates into about 15 percent of revenue, Herman says. This suggests that hourly work is less lucrative than work billed using an alternative fee structure. (Bartlit Beck partners charge $210 to $340, except for Bartlit, who charges between $470 and $570, depending on the matter.) Herman asserts, however, that without performance bonuses, nonhourly matters would generate less per hour than traditionally billed work. Jan Hoynacki, UTC's chief counsel, litigation and contracts, suggests that the firm's work habits make hourly billing a bargain. "I'm convinced that we get an extraordinarily good deal from Bartlit Beck," he says, "because they do the work so efficiently." Nevertheless, he acknowledges that his company will probably seccumb eventually to Bartlit Beck's relentless efforts to get it to use alternative fees. Even so, the resistance of a client such as United Technologies -- whose lawyers praise the service they get from Bartlit Beck -- suggests that the firm still must overcome significant barriers to win acceptance for alternative fees. The Denver office is the home of Bartlit Beck's five corporate lawyers, some-times treated as sort of poor relations by outsiders who know only the reputations of litigators like Bartlit. "Throw in that we're not just a litigation boutique," corporate partner Robert Planchard pleads good-naturedly. The group does account for about 10 percent of Bartlit Beck's revenue, according to Herman, but to listen to the Bartlit Beck partners, the decision to bring their corporate colleagues along from Kirkland was a casual one. "You want to work with a group of people you know," Bartlit says. "These were people I knew and trusted and understood." "There was no reason not to," says litigation name partner Donald Scott. "There was a good business fit." In fact, about half of the corporate diet this year consists of basic corporate and transactional work for NL and five other companies owned by Dallas financier Harold Simmons, the chairman of NL. Although Bartlit initiated the relationship for half of the top ten clients, the other partners are increasingly bringing in their own business, the firm's six equity partners say. 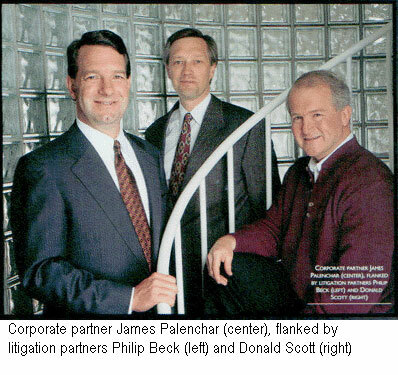 For example, corporate partner Palenchar has attracted some work from Liberty Media Corporation, representing the cable television programming company in negotiating strategic alliances; corporate partner Karen Chapman is developing a relationship with United Airlines handling construction and real estate contracts; and partner Mark Ferguson has brought in patent litigation from United Parcel Service recently. So how does this all add up? "We're doing better than we did at Kirkland because we bet on results, and the results have been positive," asserts Herman. Although Herman declines to give precise numbers, he confirms that the average profits for the firm's six equity partners in 1994 were above $760,000 (what the six earned while they were at Kirkland, according to an internal Kirkland document). And, he adds, in response to this reporter's estimate, "$800,000 is not far off; it'd be a little high." Herman claims that 1995 will be even more profitable than last year. Of Bartlit Beck's 75 litigation matters, about one-third are for plaintiffs, generally corporations in commercial disputes. Of those 25 cases, ten are billed on a pure contingency basis. Instead, the typical Bartlit Beck litigation fee consists of a flat fee, paid monthly, often with an agreed-upon bonus for a given result. Herman arrives at his flat fee proposals by first looking at the number of hours he thinks a project might take. "It's the basic building block," he says, "it's the basic raw material." He then mixes in less tangible factors such as how much he thinks a competing firm would charge and how important the matter may be to the client. At the same time, Herman says, "we also like to price it in blocks." Thus Herman typically will propose several options for different phases of a case: before discovery begins; fact discovery; expert discovery; the lull before trial; then the trial itself. Some clients choose to use a flat fee for one block and hourly fees for others. The fee for each phase is negotiated separately. Herman might suggest a straight $30,000 per month during fact discovery, or $20,000 per month plus a success bonus. If Bartlit Beck delivers a specified result, the bonus is equal to some multiple of the $10,000 the client "saved" each month. The firm is both confident and client-savvy when it comes to its bonuses. Even when clients agree contractually to a specific result-based bonus, the contract permits them to reduce the bonus if they decide the firm doesn't deserve the entire amount. "I thought that was like giving great reverence to the client and allowing them to make their own decision," notes Alpha Therapeutic general counsel Colton. "I've never seen that kind of flexibility before." So far, claims managing partner Herman, no client has declined to pay the full bonus. The corporate group also uses nonhourly billing anywhere from half to two-thirds of the time, say three corporate lawyers. It can range from a flat annual fee for basic SEC filings and day-to-day questions to a flat fee for a given transaction. Corporate partner Palenchar notes that the firm strives for bonuses here, too. For instance, it might propose a flat fee of $125,000 if the deal closes and $75,000 if it doesn't. The firm's financial success stems in part from its litigation success. The work has been varied: Bartlit Beck is handling a heavy diet of patent and intellectual property litigation, in particular, as well as a range of product liability, contracts, and securities cases. In its brief existence the firm has racked up a 3-0 trial record, not bad for a 24-lawyer litigation practice with matters where hundreds of millions of dollars are at risk. Six more cases have been won on dispositive motions and another half-dozen have been settled, according to Herman. The verdicts include the patent case for Bayer last year, in which Bartlit and three other Bartlit Beck lawyers won a finding that a Bayer subsidiary had not infringed a patent for a blood testing system. Also last year, Beck and two associates shot down a 7,500-plaintiff class action against NL Industries for allegedly contaminating an area of Philadelphia with lead. In a third case earlier this year, name partner Scott and one nonequity partner successfully defended an antitrust and patent case against United Technologies subsidiary Carrier Corporation. Scott and his colleague won a summary judgment motion on one of the antitrust claims and then a jury verdict on the patent and remaining antitrust claims. In almost all of Bartlit Beck's cases an equity partner handles the case with a nonequity partner and/or an associate. Often Bartlit Beck is called in at the last minute to try a high-stakes case in which another firm has been conducting lengthy discovery. For example, Bayer's Lykos approached Bartlit Beck only five weeks before trial to take over for a Tarrytown, New York, patent firm, Sprung, Horn, Kramer & Woods. Given the high exposure and the fact that it was a jury trial, Lykos says, "I wanted to go in with the very best I could." How does Bartlit Beck manage to grab the reins so quickly? Cordis patent counsel Hank Collins and Bayer's Lykos offer similar descriptions. It all hinges on the firm's use of technology. "They have the ability in a very short period of time...to learn the case very well," says Collins, who adds, "They're the highest-tech firm I've ever seen. They just eclipse other firms in terms of their technology." According to Lykos, Bartlit and then-associate David Berten (who has since become a nonequity partner) showed up with their laptops for the first meeting with Lykos and the firm's original counsel, which stayed in the case. "They basically spent the next twelve hours utilizing their laptops very effectively," Lykos recalls. By the end of the meeting Bartlit had distributed outlines of his theory of the case. Berten, 31, has helped give the firm its technological edge. With his unruly black hair and narrow wire-rimmed glasses, Berten looks less like a computer nerd than a Parisian intellectual. But, he acknowledges, "I get the geek award." "I was flabbergasted," Beck recalls. "That to me was a revelation. It was my first glimpse. For me it was an epiphany." So, as Berten remembers it, he began teaching Beck, and then Bartlit, "how to turn on their computers." Since then, Beck and Bartlit have become computer devotees. But Berten still seems the most innovative of the firm's lawyers when it comes to technology. For example, the firm's database software, Access, is an off-the-shelf Microsoft system that Berten customized. The software functions simply, as Bartlit demonstrates, using the database he has built for the Alpha Therapeutic AIDS cases. Deposition testimony and witness statements are obtained on computer disks and stored in the lawyers' ubiquitous laptops. Then the lawyers enter each fact proposition into the database, easily done in the Windows system by highlighting the relevant testimony or statement and using the copy function to move it into the database. As each piece of information is added, it is classified into one of 12 subject areas, such as "heat treatment," "purification," "donor screening," "vaccine," "warning," and "regulatory." The computer can then provide deposition testimony and expert witness statements on any of these subjects in a variety of forms: It can list all material in that subject chronologically, for example, or provide only the responses from a particular witness. In addition to the Access database, each lawyer makes liberal use of "Discovery Pro," litigation software that allows lawyers to search deposition testimony for words or phrases. In fact, the lawyers use the program so much that Fred Bartlit himself is pictured on the cover of the annual report of its manufacturer, Quixote Corporation (which is also a Bartlit Beck client). All this high-tech capability makes a big difference at trial, Bartlit Beck lawyers say. In the class action suit against NL last year, partner Beck says he stored not only all of the thousands of pages of depositions, exhibits and witness statements, but also past testimony of the other side's experts. Then, with his laptop at the counsel table, if an expert said something that sounded fishy on direct, Beck could easily call up the witnesses' testimony -- from this case or one in the past. Comparing the two, Beck, who's built a reputation as a ferocious cross-examiner, could then impeach the witness. The technology, staffing, and hands-on approach are tightly intertwined at Bartlit Beck. With only 29 lawyers, they're quick to remind you, they can't waste anybody. But their databases, in particular, help them to handle big suits. For example, in the Cordis patent case earlier this year, the firm was retained in early June for a trial that was set for early August (though it wound up getting pushed back to early September). While flying back from meeting the client, then-associate Berten created the parameters for the database in the case. Then partners Bartlit and Scott divided up the 50,000-100,000 pages of discovery with Berten, each coding the material as he read it. As the Bartlit Beck lawyers stress, their firm has no miracle technology. In fact, most big firms have all of these tools. It's simply that this firm actually uses what it has. Many of Bartlit Beck's clients are linked to it by e-mail, for example, so work product travels quickly. The same e-mail and the firm's $500,000 wide area network give the lawyers access to all of the files in the network server from any location, so work can proceed from wherever there's a phone jack. All in all the firm has spent about $60,000 per lawyer in technology, which includes everything from the basic word processing and voicemail to the discovery software and e-mail. Hard Work Will Set You Free? It's not hard to see why the younger lawyers like practicing at the firm. "I just feel I have a tremendous amount of control over the cases," says nonequity partner Lindley Brenza, 33. "I bear the costs of my decisions. You don't have to check with anyone else." At Kirkland & Ellis, Brenza says, "I felt that I was trying to please the partner I was working for more than the client." Nonequity partner Peter Bensinger, Jr., 37 who previously worked at both Kirkland & Ellis and Paul Weiss Rifkind Wharton & Garrison agrees: "There's no one here to say, 'I want a memo on my desk on Monday morning.' There's no memo [unless the client asks for one]." "There are consequences to having a diamond [structure] instead of a pyramid. You can't just throw the work down to a junior associate. That means even the most senior partners do routine work. Name partner Palenchar recalls a recent acquisition (which ultimately didn't close) in which he represented the seller. The client, Valhi Inc., one of the companies controlled by Bartlit Beck client Harold Simmons, needed a seller's stock purchase agreement. "And I just did it," Palenchar says, "and I did it in one-tenth the time it would've taken at Kirkland. . . . Only one person touched it. It was actually really liberating." So where does Bartlit Beck go from here? Herman says he'd like the firm to be generating 80 percent of its revenue through alternative fees by the firm's four-year anniversary. It seems like a reasonable target given the satisfaction most clients have expressed with the arrangements so far. And it's the client satisfaction, ultimately, that reveals more than any general discussions of staffing or billing. In that category, Bartlit Beck is scoring off the chart. "In terms of the quality of service we're getting for the price we're paying," says Richard Burt, the general counsel of Asea Brown Boveri, an electrical engineering and manufacturing company, "it's hard to imagine it being any better. "It's a commitment that they've got to their clients and to the practice," says Farrel Vogelhut, associate general counsel at United Technologies. "It's very real there in a way that you just don't see in a lot of places." Although no clients were willing to specify the fees they pay, they all seem convinced that they are saving money because of Bartlit Beck's efficiency. "It's still a work in progress," says managing partner Herman. "We have a general plan. We don't have anything to pattern ourselves after." It will take time before one can separate out people's response to the firm's lawyers and to its ideas. It may not occur until after Fred Bartlit has moved on from the legal scene (which he contends he'll never do). And then the firm can really test another of its credos, as expressed by Brenza: "It's a principle of economics. It's not a matter of Fred." Nicholas Varchaver is a Senior Reporter for The American Lawyer This article is reprinted with permission from the December, 1995 edition of the American Lawyer © 1995 NLP IP Company. All rights reserved. Further duplication without permission is prohibited.